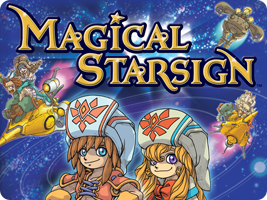 Magical Vacation and Magical Starsign tell the stories of an unusual group of magical students that study at the Will O'Wisp magical academy. Unite with your fellow students and use their special powers to advance through tough enemies and puzzles. Your magical power is affected by various factors, such as the skills of the other students in your team, or even the alignment of the stars themselves.